Synopsis, taken from dust jacket of book: Amy is a cryogenically frozen passenger aboard the spaceship Godspeed. She has left her boyfriend, friends - and planet - behind to join her parents as a member of Project Ark Ship. Amy and her parents believe they will wake on a new planet, Centauri-Earth, three hundred years in the future. But fifty years before Godspeed's scheduled landing, cryochamber 42 is mysterious unplugged, and Amy is violently woken from her frozen slumber. Someone tried to murder her. Now, Amy is caught inside a tiny world where nothing makes sense. Godspeed's 2,312 passengers have forfeited all control to Eldest, a tyrannical and frightening leader. And Elder, Eldest's rebellious teenage heir, is both fascinated with Amy and eager to discover whether he has what it takes to lead. Amy desperately wants to trust Elder. But should she put her faith in a boy who has never seen life outside the ship's cold metal walls? All Amy knows is that she and Elder must race to unlock Godspeed's hidden secrets before whoever woke her tries to kill again. This book was really good - completely different from anything I've ever read. The concept was so interesting - between the cryogenically frozen people and the spaceship headed from earth to a new planet in hopes of inhabiting it, I thought it was very creative and clever. The whole thing was also fairly disturbing. I'm still pretty new to anything that falls under the umbrella of dystopian, so I'm still trying to become desensitized to it in a way. The descriptions were really good - the freezing process had my lungs constricting in a claustrophobic way, Eldest's behavior and the way he lied made me angry, Amy's fear and anxiety, desperation and sorrow were all so real, as were Elder's anger and annoyance at being kept in the dark by Eldest, who didn't think Elder would make a good leader. I loved how Ms Revis worked in so many different concepts and themes. Eldest ruled through fear and manipulation, having changed earth's history for his benefit to make it seem as if eradicating differences was the best way to live in harmony (for example, history had been changed to show that Hitler had the right idea, and that was who Eldest emulated in his role as leader). All the inhabitants of the ship were monoethnic - there was one race, because according to Eldest, differences were a reason for discord among people. Because everyone on the ship looks the same (dark hair, dark eyes, dark skin), Amy really stands out with her red hair, green eyes and pale skin, and is labeled a freak. Eldest doesn't want her encouraging free thought among the people, who are all tightly controlled, and who are, as a consequence, mindless. He also doesn't want Elder to start thinking for himself any more than he already does, because he believes the only way to lead the ship is his way, and he wants Elder to follow in his footsteps. 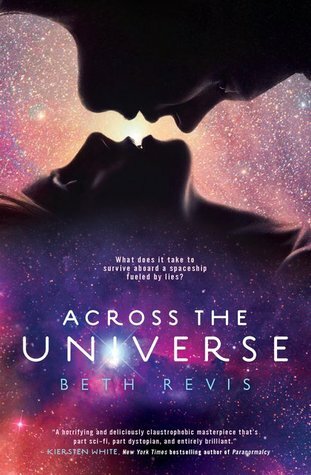 I thought this was a terrific debut by Beth Revis, and I can't wait to read the next book in the series. I just hope she doesn't make us wait too long!